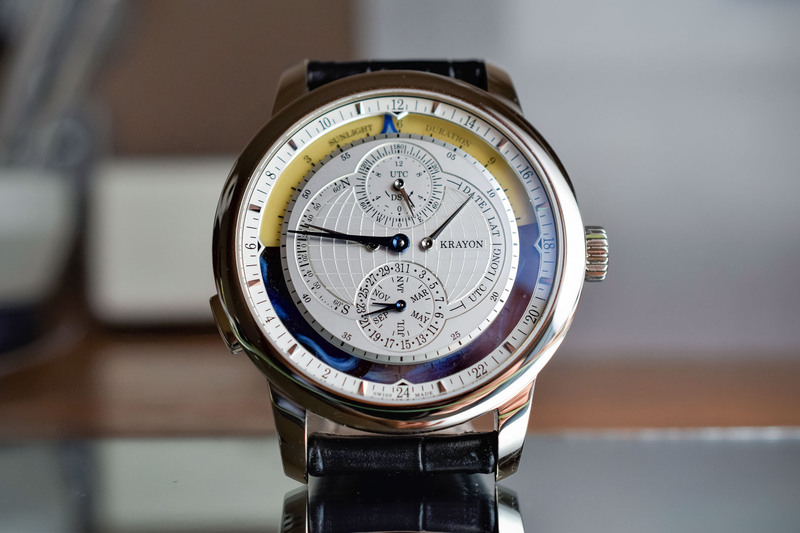 World first – Krayon, a movement design engineering studio based in Neuchatel, unveils Everywhere, the first mechanical wristwatch to be able to calculate and display the sunrise and sunset times everywhere on the globe. Like many simple, good ideas this is easier said than done. We take a look at this highly impressive mechanical calculator, which also indicates time by hours, minutes and seconds. Although quite rare, some watches indicate the sunrise and sunset times (for instance Audemars Piguet with the caliber 2120/2808). However these are usually calibrated according to a given place determined by the watch’s owner. From a technical perspective, these are (relatively) simple. Cams designed in relation with the particular place rotate once a year and allow to display the changing sunrise and sunset times. This was not good enough for Remi Maillat, the founder of Krayon. Christened ‘Everywhere’, the first creation under his name features universal sunrise and sunset indication – i.e. providing these indications everywhere, with the possibility to adjust the place. A prototype of the Everywhere prototype (not decorated at this stage) allowing to catch a glimpse of the complexity of this mechanical calculator. 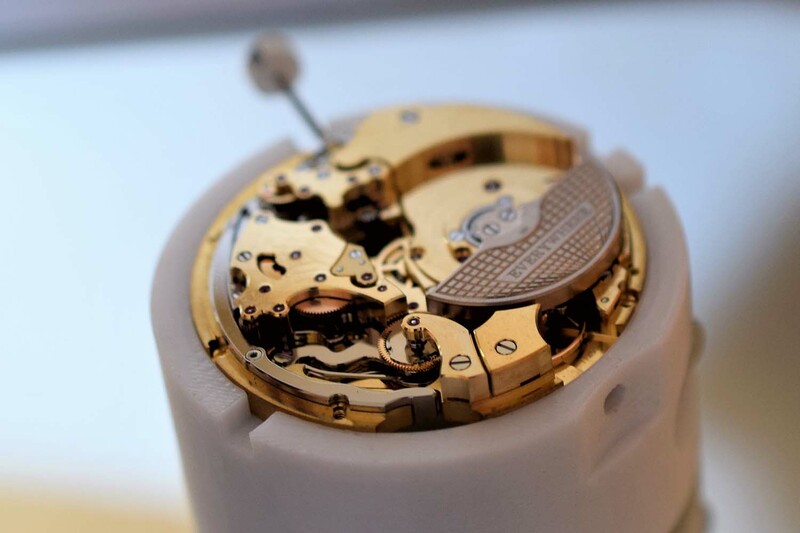 On the left hand side, around the movement, the lever allowing to switch the adjustment mode via the pusher on the case. In the foreground, the two raised bridges are holding in place the balance wheel (right hand side) and the complex differential system driving the universal sunset/sunrise indication (left hand side). 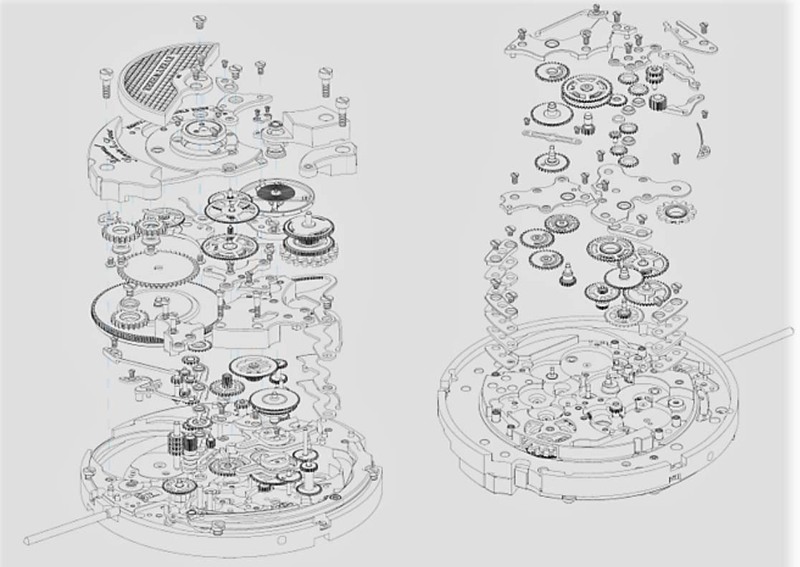 The ultra-complex movement is a mechanical calculator comprising 595 components including 85 jewels, 4 differentials, 84 gear assemblies and 145 gear parts. To determine the sunrise and sunset times everywhere, it needs to compute the date (taking into account the equation of time), the latitude, the longitude and the UTC. The equation of time is a physical effect which measures the difference between the Mean Solar time (civil time) and the Real Solar Time. The actual length of a day is not 24 hours. It varies between -16 and +16 seconds daily which makes a maximum annual difference of +14 and -16 minutes. 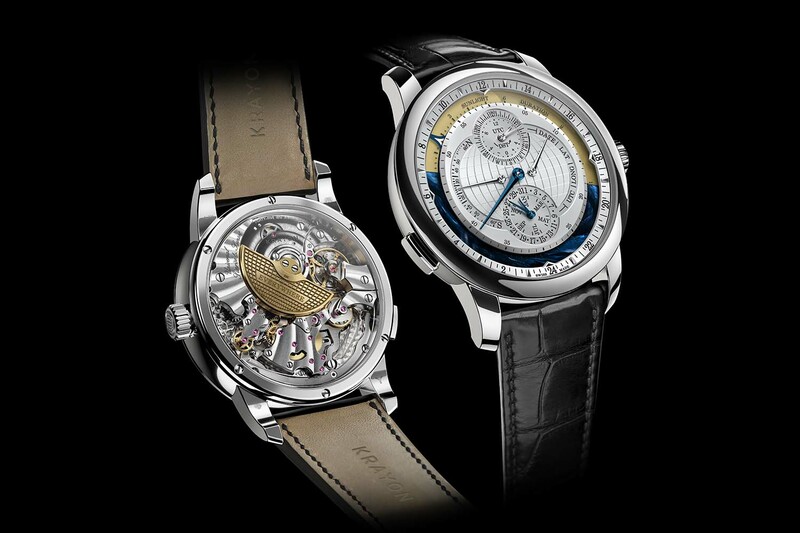 The 24 hour day measured by watches is the Civil Time which represents a compromise of the variation. 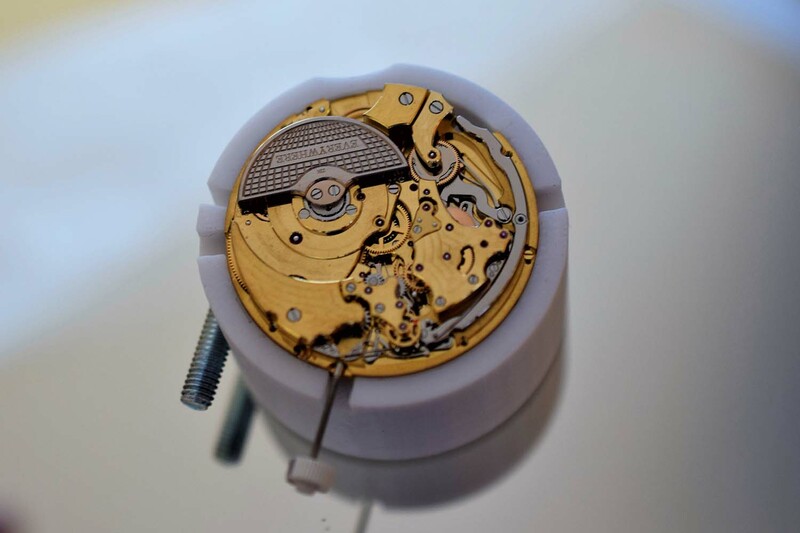 Despite this complexity, the micro-rotor movement is impressively compact, being just 6.5 mm high. On the other hand, it is large at 35.4 mm in diameter and looks stunning through the sapphire case back. 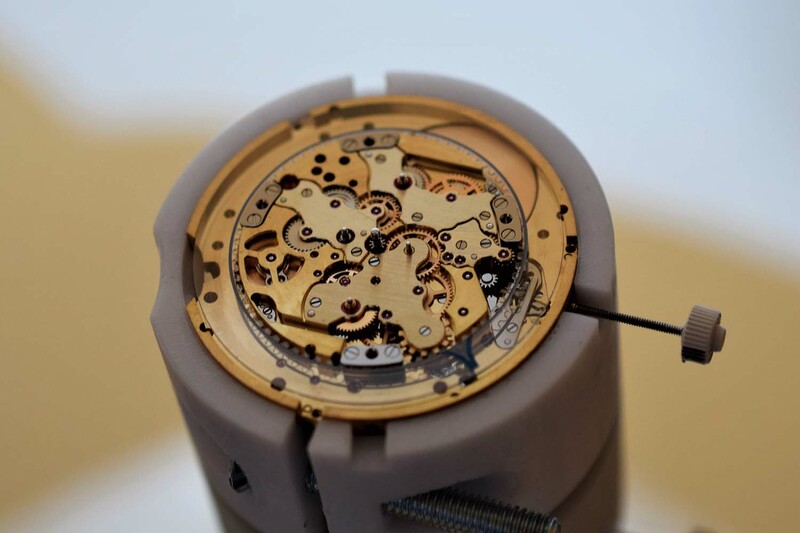 The movement is hand-finished with a specific pattern radiating from the center of the movement, circular graining, hand-made chamfers or engraving on the 22K gold micro-rotor. It is ticking at 3 Hz. for a healthy power reserve of 3 days. 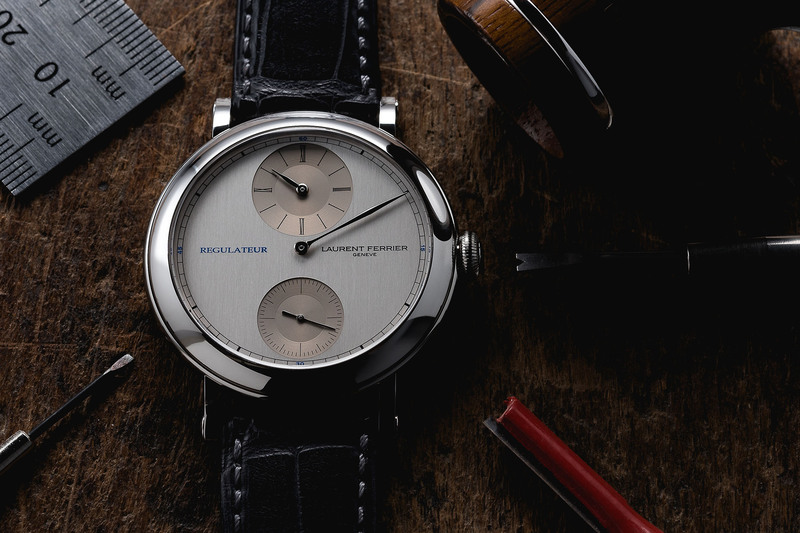 The hands in daily use (date and time) are rendered in blue for enhanced legibility. 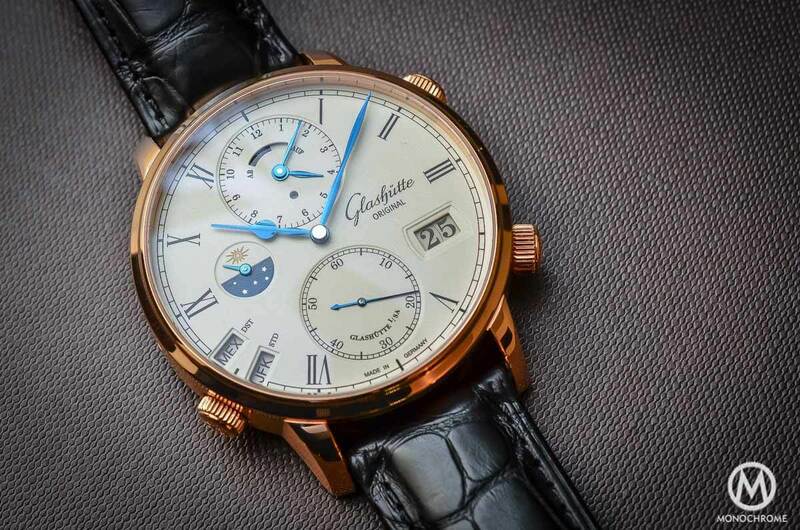 The hands corresponding to the settings are in white or pink gold depending on the versions. The minutes are shown in the center by a large hand. 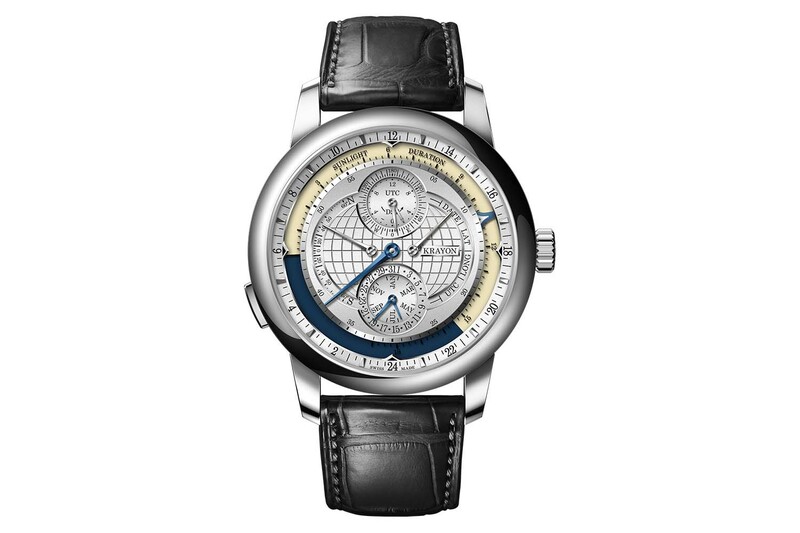 The hours are read on the contour of the dial thanks to a blue arrow on the 24 scale. It also allows to visualize how many hours have passed since sunset. Three overlapping discs driven by the movement, including one bearing the hour pointer, allow to indicate the duration of the day and night. Adjusting the watch is a rather simple operation once you know all parameters that needs to be input, in particular the date, the UTC, your latitude and your longitude. 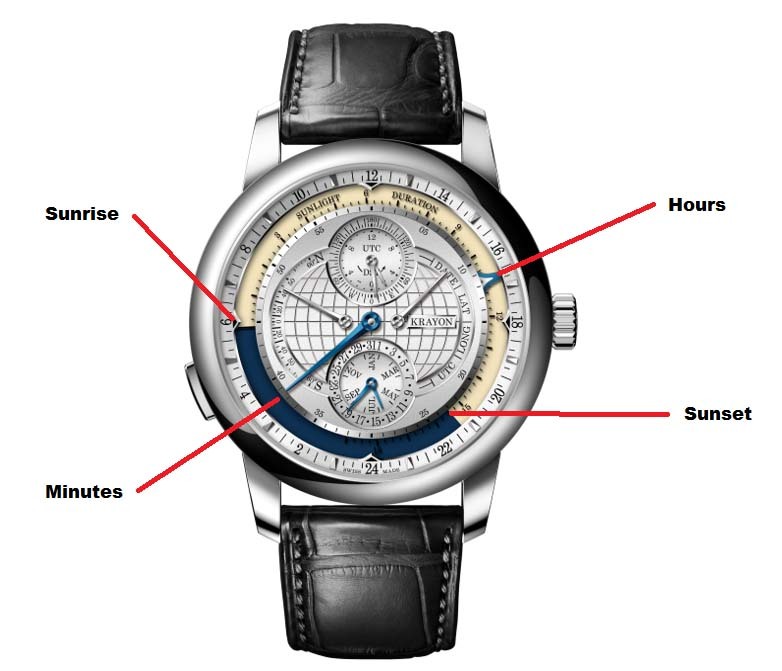 The crown has three positions, the first one for winding, the second for adjusting the time and the third to adjust the universal sunrise/sunset parameters. Pressing the pusher at 7 o’clock allows to set successively all indications one after the other via the crown. These can all be set forwards and backwards, thereby protecting the movement against mishandling. You can watch the short demo video which is just under a minute in length. Naturally, if you need to know the time of sunset to make a love declaration, the information is quite easy to find nowadays (on the internet for instance). But the technical complexity of the Krayon everywhere is indeed impressive. And somehow, the fact that such as mechanical calculator is not as useful as it would have been back in times just adds to its charm! 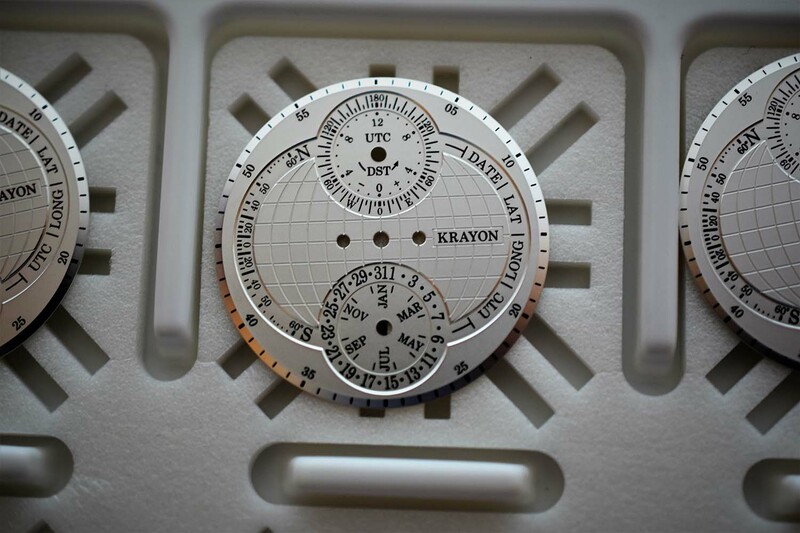 The Krayon Everywhere does not have a fixed retail price as each piece will be made-to-order (with the possibility to customize the watch) but starting price is a hefty CHF 600,000 Swiss Francs. The watch will be officially launched this fall and we will share pictures as soon as we have a live photo opportunity. 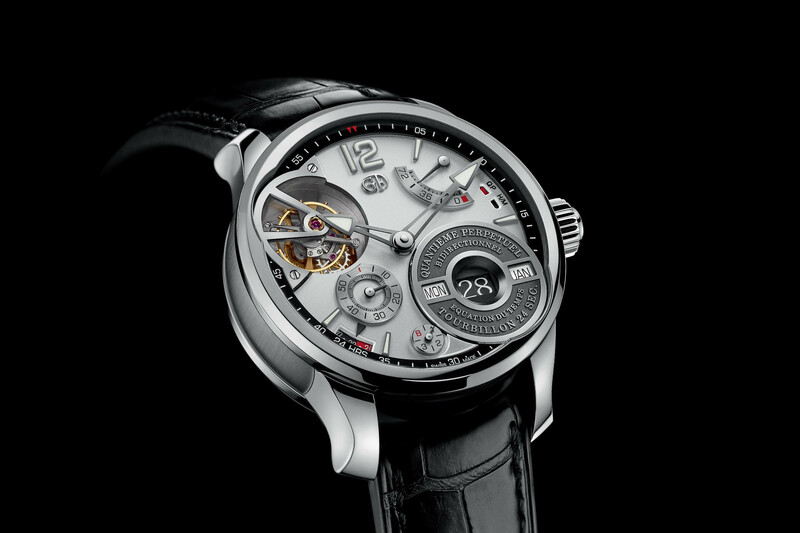 Movement: mechanical with automatic winding (micro rotor) – 35.40 mm x 6.50 mm – 72 h power reserve – 21,600 vibrations/h – 85 jewels – hours, minutes, date, month, universal sunrise and sunset time, daylight duration. 595 parts. Beautiful timepiece! beyond ridiculous pricing! really really wake up! 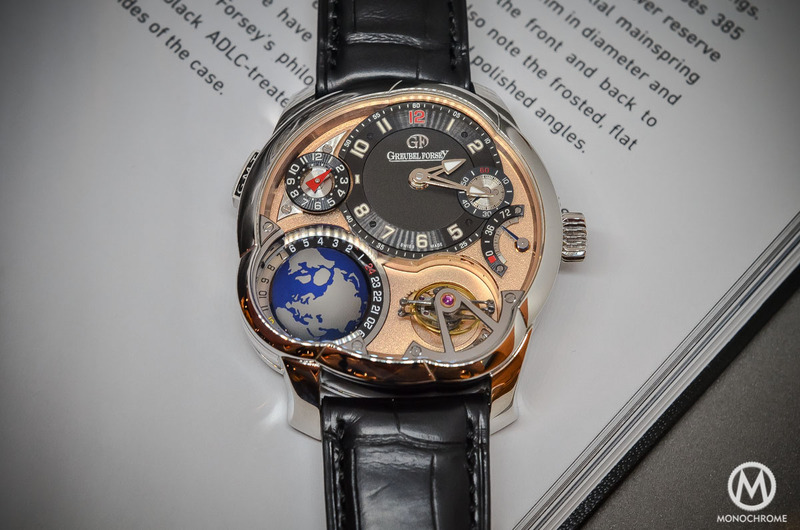 such an innovative complication, like a fresh air in watch-making industry, impressed by its complication, its ingenious idea and its elegance. Give us your consent I agree to my personal data being stored and used to receive the newsletter or other updates about Monochrome Watches.